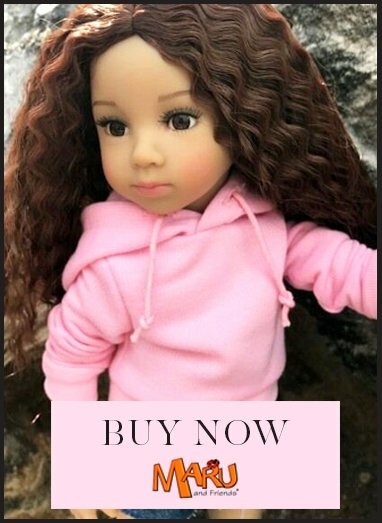 Brand: Paola Reina/Las Amigas Eye type: Hazel-Brown/ Fixed Size: 32cm/ 13" Hair: Strawberry-Blonde/ Rooted Articulation: 4 points Paola Reina was established in Spain in 1994 and has achieved worldwide success with its beautiful dolls. Paola Reina Las Reinas dolls are thoroughly European as not only are they made in Alicante in coastal eastern Spain, all their component parts are sourced from Europe. Dasha is a vibrant 32cm vinyl doll with rooted hair and a soft vanilla scent. She's gloriously pretty with her dusting of freckles and light hazel eyes. Her hair is strawberry blonde in colour and she has it styled in a fringe with some bounce to the length. She's such an engaging little friend. Dasha is one of the Las Amigas or "Friends" collection and she has her own section of clothing in the My Doll Best Friend shop. Dasha is dressed in her very special, very beautiful First Communion dress, headdress and shoes as today she is celebrating the first time that she takes Holy Communion in front of her friends and family at Church. Her ivory dress is very long and full with lots of lace detail. The puff sleeves are three-quarter length and edged in lace. On her feet she wears ivory shoes with a little pearl detail and around her neck she wears a beautiful gold pendant necklace. She has opted for an ivory headdress with pretty flowers and bows on it to complete the look. She will certainly look very pretty in her photos.